This is a great resource for expanding on basic corrosion knowledge and access additional resources on corrosion prevention and mitigation methods. It contains general information on what corrosion is, factors to consider, common forms of corrosion and the importance of corrosion prevention. Corrosion is a naturally occurring phenomenon commonly defined as the deterioration of a material (usually a metal) that results from a chemical or electrochemical reaction with its environment.1 Like other natural hazards such as earthquakes or severe weather disturbances, corrosion can cause dangerous and expensive damage to everything from vehicles, home appliances, and water and wastewater systems to pipelines, bridges, and public buildings. Unlike weather-related disasters, however, there are time-proven methods to prevent and control corrosion that can reduce or eliminate its impact on public safety, the economy, and the environment. The science of corrosion prevention and control is highly complex, exacerbated by the fact that corrosion takes many different forms and is affected by numerous outside factors. 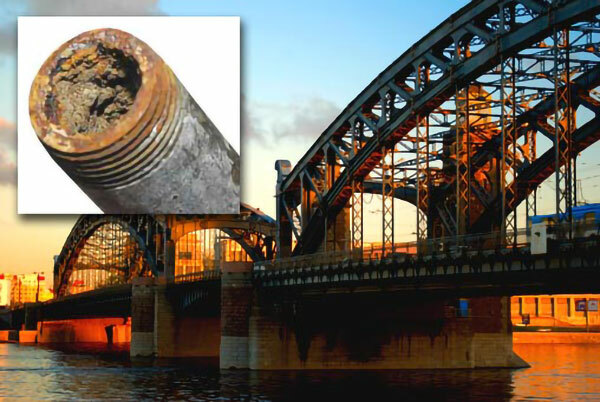 Corrosion professionals must understand the effects of environmental conditions such as soil resistivity, humidity, and exposure to salt water on various types of materials; the type of product to be processed, handled, or transported; required lifetime of the structure or component; proximity to corrosion-causing phenomena such as stray current from rail systems; appropriate mitigation methods; and other considerations before determining the specific corrosion problem and specifying an effective solution. Simply put, corrosion is the natural deterioration that results when a surface reacts with its environment. Different surfaces, environments and other factors add complexity to the equation. 1. Corrosion Basics, An Introduction, L.S. Van Delinder, ed. (Houston, TX: NACE, 1984). 2. NACE International Basic Corrosion Course Handbook (Houston, TX: NACE, 2000). Also referred to as "general corrosion" or " uniform corrosion," general attack corrosion proceeds more or less uniformly over an exposed surface without appreciable localization. This leads to relatively uniform thinning on sheet and plate materials and general thinning on one side or the other (or both) for pipe and tubing. It is recognized by a roughening of the surface and usually by the presence of corrosion products. The mechanism of the attack typically is an electrochemical process that takes place at the surface of the material. Differences in composition or orientation between small areas on the metal surface create anodes and cathodes that facilitate the corrosion process. Most often caused by misapplying materials in corrosive environments, general corrosion often can be tolerated because the effect of metal loss is relatively easy to assess and allowances can be made in the initial design. Protective coatings are particularly effective in controlling uniform corrosion. Cathodic protection (CP)-an electrochemical technique used for corrosion control (see "Methods of Corrosion Control" later in this article)-can be used in underground or immersion situations. Unlike general attack corrosion, localized corrosion occurs at discrete sites on a metal surface. Types of localized corrosion include pitting, crevice, and filiform corrosion. There are 10 primary forms of corrosion, but it is rare that a corroding structure or component will suffer from only one. The combination of metals used in a system and the wide range of environments encountered often cause more than one type of attack. Even a single alloy can suffer corrosion from more than one form depending on its exposure to different environments at different points within a system. All forms of corrosion, with the exception of some types of high-temperature corrosion, occur through the action of the electrochemical cell (Figure 1). The elements that are common to all corrosion cells are an anode where oxidation and metal loss occur, a cathode where reduction and protective effects occur, metallic and electrolytic paths between the anode and cathode through which electronic and ionic current flows, and a potential difference that drives the cell. The driving potential may be the result of differences between the characteristics of dissimilar metals, surface conditions, and the environment, including chemical concentrations. There are specific mechanisms that cause each type of attack, different ways of measuring and predicting them, and various methods that can be used to control corrosion in each of its forms. Figure 1: Electrochemical Cell In a corrosion cell, electrons flow through a metallic path from sites where anodic reactions are occurring to sites where they allow cathodic reactions to occur. Ions (charged particles) flow through the electrolyte to balance the flow of electrons. Anions (negatively charged ions from cathodic reactions) flow toward the anode and cations (positively charged ions from the anode itself) flow toward the cathode. The anode corrodes and the cathode does not. There is also a voltage, or potential, difference between the anode and cathode. Source: NACE International Basic Corrosion Course Handbook, p. 2:9.